"2. 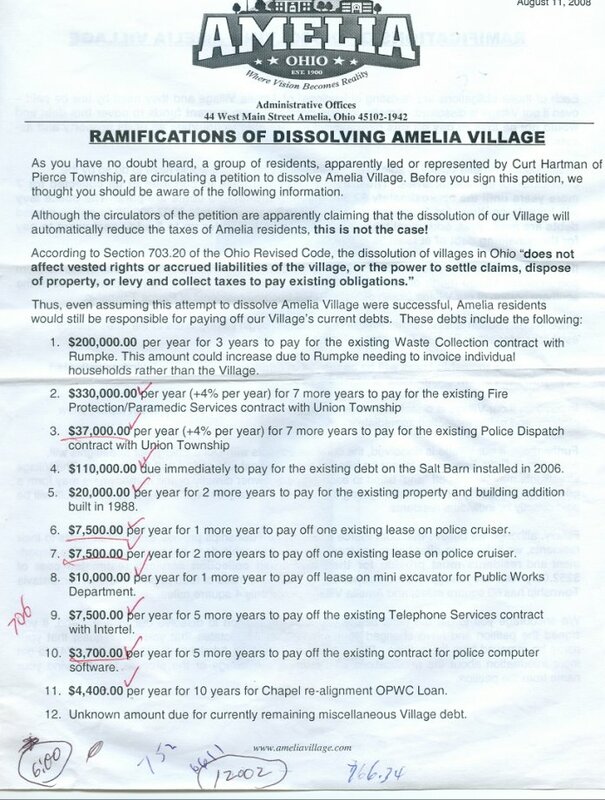 $330,000.00 per year(+4% per year) for 7 more years to pay for the existing Fire Protection/Paramedic Services contract with Union Township"
The above was copied from the threat-letter titled RAMIFICATIONS OF DISSOLVING AMELIA VILLAGE" dated August 11th, 2008. This letter was in the names of Leroy Ellington and Mark Menz. Next up is a copy if the first page of the contract with Union Township to provide fire and ems services to Amelia. If you want to view the whole contract it is in PDF format and just click here. I received the PDF file from a co-worker in the fight to get rid of these leeches. Could I swear to God it is original? Not to God but I could to anyone else! I would bet my house on it! If you examine the threat-letter you will see that false ramification #2 is yet another out and out big fat lie used by Ellington and Menz to scare you and me into not opposing them and their get rich schemes! If you look at the PDF file page #2 you will be able to see the contractual costs that are real and bear no resemblance to those stated in the threat-letter. A small lie compared to the actual usage of the Fire\Ems false ramification that we will owe this as a debt. I confess I am not a lawyer. But I can read and I am usually able to understand what I read. If you look at page 1 of the contract under term of agreement it states "The parties may terminate this Agreement at any time upon written mutual agreement." Wait a minute! Sorry folks. It just occurred to me that what I need to do here is cover all the lies I can so I don't end up with hundreds of pages of work to do. Please forgive my selfish attitude about this. Let me start from the beginning. Next up is a excerpt from the threat-letter of August 11th, 2008. First: Curt Hartman. Just to set the record straight. Curt is not leading this group of citizens. What Curt has graciously done is volunteer his services in helping us to rid ourselves of those who would impose more hardships upon us. Second: Paragraph 2. I don't remember anyone on our side claiming anything about an automatic tax reduction. 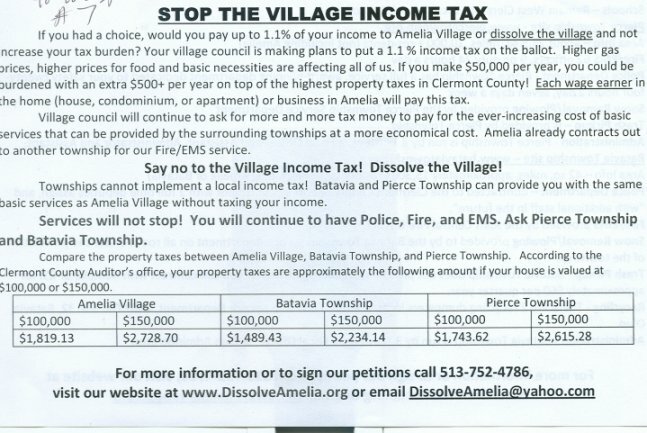 I've looked at the http://dissolveamelia.org/ web site and I can't find any such statements. Below is a photo of the little flyer that we pass out. Is there any claim to an automatic tax reduction in this flyer? NO. It does illustrate that Amelia Villagers do pay more than those living in the townships but that is not "an automatic reduction" it just something Ellington and Menz do not usderstand, THE TRUTH! To Ellington and Menz. Why don't you provide us with some hard proof of this accusation? Not in your words, no one is listening to your diatribe anymore! Third: I have not looked into paragraph 3. I am assuming that proper debt should and must be paid. Any law abiding responsible citizen would agree. No argument here. We already have proven beyond a shadow that #1 is a lie. It is hard to imagine that there is a bigger lie in this document than to state that we have a $600,000.00 debt to Rumpke when we have no debt to Rumpke at all. But #2 is a bigger lie. First it is not a debt but it is a contract for services. You can see this if you go back to the top of this page. The same applies to #3. THESE ARE NOT DEBTS THAT YOU HAVE TO PAY AND THEY KNOW IT! Menz even signed the contract back in 2004!